In the world of online gaming, Microgaming has earned a reputation as a stickler for perfection. Not only are their games eCogra certified, they are often amongst the most visually stunning you can play online, and offer users a fully realised version of their chosen game. Vegas Craps, their new offering, is no different and has raised the bar for online craps games. In truth, there was little wrong with Microgaming’s original version of the game, it played well enough and looked good, but this new version has taken this on a level. The graphics now are intricate and delicate, sharp and clear. The level of detail on screen both in terms of static graphics and animations are simply first class. Yet fancy graphics and a decent soundtrack do not guarantee a great game, that comes from the gameplay and it is here that Microgaming have succeeded greatly, capturing the essence of Vegas Craps tables beautifully, with a simple, intuitive betting interface that allows users to make their bets speedily, so the gameplay really picks up a pace. It is this that is the crucial element that really makes the game, there’s nothing guaranteed to annoy a craps player than slow gameplay, and this is where Microgaming have hit the nail firmly on the head. Vegas Craps is quick, fun and frantic with betting action thick and fast and with enough variation for both beginners to play the passline and more experienced players to wager across the full range of bets available. A top prize, if you bet the full 100 credits on the 30-1 shots of doubles on or six and get lucky, of 3,100 credits is possible, with a huge range of bets available from even money shots upwards. 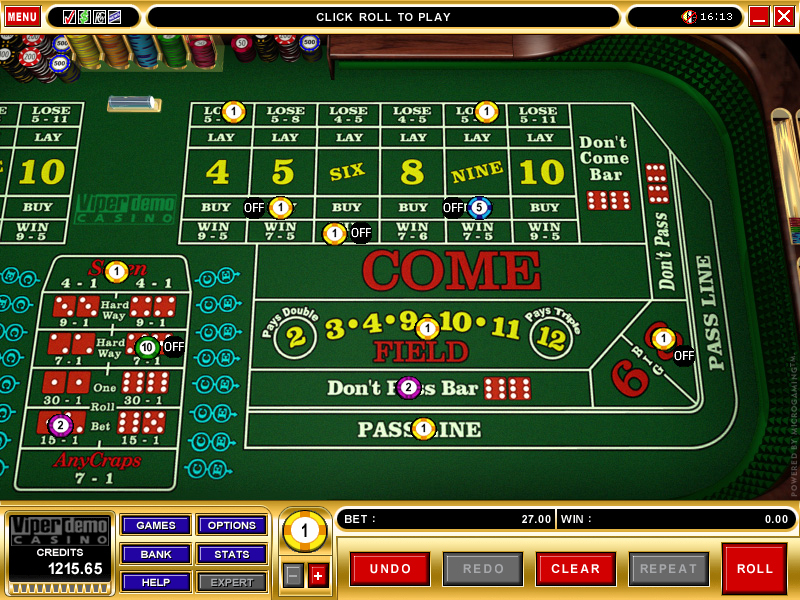 Vegas Craps is the essence of the game captured in digital format. Check out your preferred Microgaming casino now and pick up the dice to see if you can roll yourself into profit!